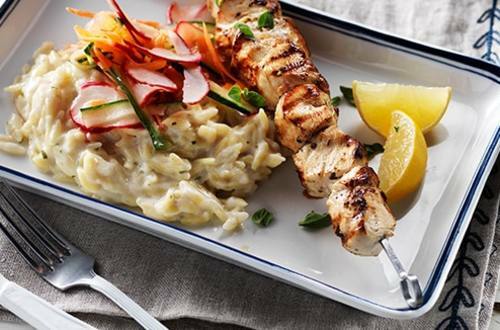 Lemony chicken skewers are grilled and served over creamy orzo and served with a crisp shaved vegetable salad. 1 Grate 1/4 teaspoon (1 mL) lemon peel and squeeze 2 tablespoons (30 mL) juice from lemon. Combine chicken, 1 tablespoon (15 mL) oil, 1 tablespoon (15 mL) lemon juice, oregano and garlic in medium bowl. Season, if desired, with salt and pepper; thread onto skewers. Grill, turning occasionally, until chicken is thoroughly cooked, about 6 minutes; set aside and keep warm. 2 Combine 1-1/2 cups (375 mL) water, milk and Knorr® Alfredo Pasta Sauce Mix in medium saucepan and bring to a boil over medium-high heat. Add orzo; return to a boil and cook over medium heat, stirring frequently and adding additional water in 1/4 cup (60 mL) increments if necessary, until orzo is tender, about 8 minutes. Meanwhile, combine shaved vegetables, remaining 1 tablespoon (15 mL) oil and 1 tablespoon (15 mL) lemon juice in medium bowl; season, if desired, with salt and pepper. 3 Just before serving, stir lemon peel into orzo. Serve chicken over orzo with shaved vegetable salad. Serve, if desired, with lemon wedges.